← Balmy Summer Nights. Limoncello, Bombay Sapphire Gin and Basil Cooler. Its December First. Hello Summer. Another hot, humid, sticky day. We woke to a summer rain storm. Today’s headline in the Sydney Morning Herald reads “Summer in the City…and its Hot, Hot, Hot”. Somehow I don’t think its going to cool down any time soon. Remember Nat King Cole’s song Those Lazy-Hazy-Crazy Days Of Summer? Methinks those days have well and truly arrived. Usually I begin my morning routine with a hot, frothy cappuccino. Not today. I need something smooth and cooling. A fresh fruit smoothie hits the spot. So simple to whip up and perfectly refreshing. In a blender blitz banana,orange juice, raspberries and yoghurt until smooth. 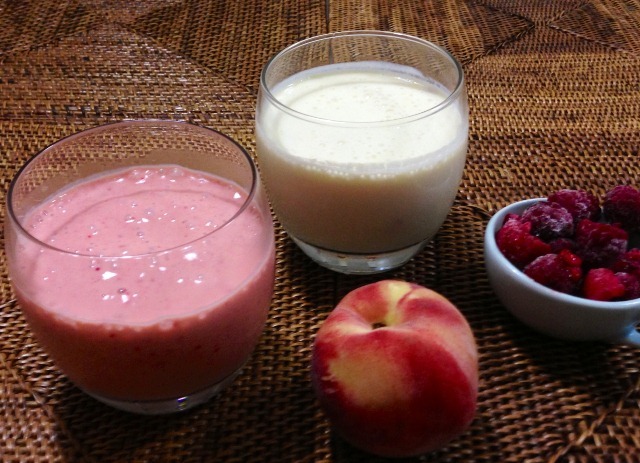 In a blender blitz peach chunks and their juice, yoghurt, honey, lemon juice and ice until smooth. This entry was posted in Breakfast, What I Love to Cook, What I Love to Drink and tagged Banana, Breakfast, Food, Gluten free, honey, Lemon, Peaches, Raspberry, Smoothie, Summer, Yoghurt. Bookmark the permalink.